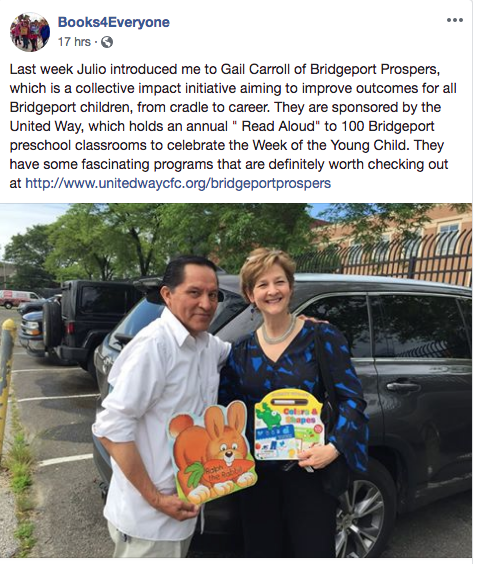 I'd like to introduce you to Officer John Maldonado from Bridgeport's Multinational Magnet School. He is part of a a group that organizes a trip to Florida for 35 8th graders every year. The students help with the trip and learn about planning and budgeting, as well as have presentations during the trip on business and careers. Included in the trip is a visit to the Wizarding World of Harry Potter at Universal studios and all students read Harry Potter books in advance. We hope to provide them with many copies of the print and audio books, and are off to a great start! I'm sorry to say that Doug Francefort who has run the Book recycling operation at Greenwich Recycling has had a serious fall and will no longer be able work. At 89 he has been so inspirational in his dedication to finding new homes for gently used books. We will miss him very much. The Book Swap in Greenwich is the source for at least 35% of all the books we redistribute throughout Fairfield County and we are currently seeking new volunteers to work 1 -2 days a month at either the Friday or Saturday 8-12 sessions.